My own mother used to say that it’s important to always eat healthy food, because it later turns into our thoughts and actions. I couldn’t agree more – because it also turns into memories. It’s sometimes difficult to know how to begin on the journey to good health and well being through food. An easy way to check if you’ve achieved a good variety in, say a curry, stir fry or fruit salad, is to do a ‘rainbow’ fruit and vegetable colour test. If there are three or four different colour types (reds, purples, greens, orange/yellows) in your dish, the chances are you are getting a nutrient boost, compared with an equivalent dish made with similar types of ingredients. 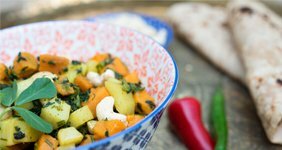 For an example, our new EA “Aloo Methi Hot Salad” recipe uses sweet potato, as well as white potato with fresh green methi leaves, and is finished off with cashew nuts. Together with the spices, this gives a more flavoursome and nutrient rich version of the traditional white potato and methi hot salad. 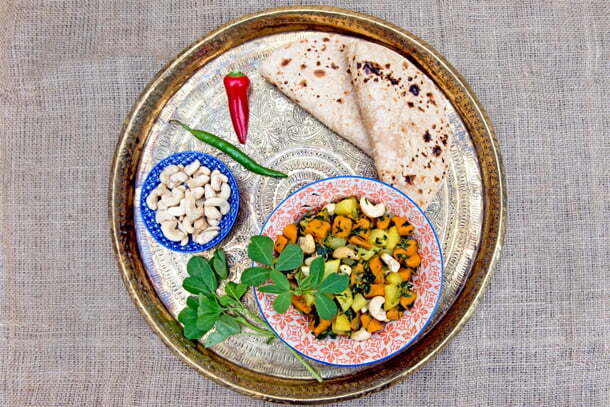 If you would like to try using our Elephant Atta Chakki Gold, for your chapattis and breads, then please visit our bread recipes’ page for the latest recipes and ideas.